Famed Pop artist Roy Lichtenstein’s “Electric Cord” may have been painted in 1961 but no one who wasn’t alive in the 1960s has ever seen it. Why? Because in January 1970, when art dealer Leo Castelli sent it to art restorer Daniel Goldreyer for cleaning, it mysteriously disappeared. Fast forward to December 2006, when the Roy Lichtenstein Foundation, a nonprofit dedicated to the artist’s legacy, published an image of the black and white work on the front of its holiday card and appealed to its community for help locate the work. It kind of worked. This past summer, the painting resurfaced at the Hayes Storage Facility in New York, where it was being stored by the Quinta Gallery art gallery of Bogotá, Colombia, as a consignment from Goldreyer’s widow, Sally Goldreyer. Oops! According to Sally Goldreyer, when her husband died in 2009, she and others began to clean out the lockers of his company’s employees, including an employee named Ben Dolinsky (Dolinksy). She contends that the contents of Dolinksy’s locker were boxed and given away to a “friend,” who, three years later, asked her to sell the “Electric Cord” for him. She claims that she then offered to sell the “Electric Cord” to the Quinta Galeria art gallery but refunded the gallery’s deposit when she found a missing notice for the painting posted on the Internet. 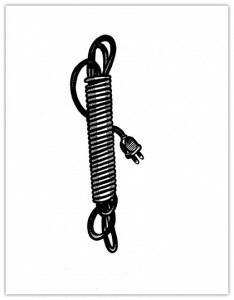 But don’t worry, there’s a happy ending … “Electric Cord” was returned earlier today to Barbara Bertozzi Castelli, the art dealer’s widow.